Waning gibbous 64% moon, which is optimal for lighting night landscape without washing out star trails. Snow storm ended the day before, which left a couple inches of snow from 8,500' to 14,259'. Really helped this moonlit shot. Image captured in Upper Beaver Meadows at 4:23 AM on 10/28/10. Looking generally South. I especially like this image because the star trails are flowing from left to right (earth rotation). The mountain wave cloud is flowing from right to left (prevailing westerly winds). Makes for a dynamic image. 35mm lens focal length...full size sensor. Raw image. Aperture 3. Silver Efex Pro plugin. Moonlight Sonata, the piano sonata No. 14 in C♯ minor (Quasi una fantasia) by Beethoven, was completed in 1801. It is believed that Beethoven dedicated the piece to his student with whom the composer fell in love. Moonlight Sonata was one of Beethoven�s most popular sonatas. I love to play the music while looking at the image. It works! 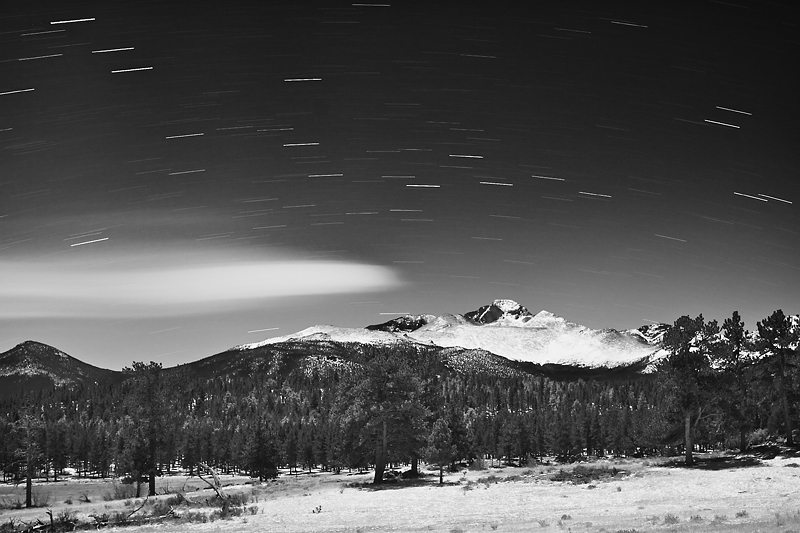 For the record, when I print this out, the star trails are not jaggy. On my monitor, they look jaggy. Must be a screen resolution thing.... 96 ppi monitor vs. 350 ppi image. Keep in mind that any monitor can only display curved lines as a series of pixels. The thinner the line, the more obvious the pixelization. And since star trails are extremely thin lines (maybe just a pixel or two wide), you are going to see some pixelization. Finally, this image was captured on October 28, 2010. During subsequent days of the challenge entry time duration, the sky/weather conditions were never like this again. So, I consider this a lucky capture. Post challenge: I'd like to hear from the 15 people who voted less than 5. What suggestions for improvement do they suggest? What a lovely sensuous curve the mountain has. Hey Richard, I don't know how I missed commenting on this. I got to wondering, "Hey, didn't that hahn guy enter the 4AM? I coulda' sworn he had said he did..." and I went looking and here you are, lurking in plain sight in the top 10 with this lovely capture. I wouldn't worry about the 15 who voted less than a 5... Some peoples' boats just float in different streams, you know? exquisite! Congratulations on top ten! The black and white added a touch to this... I would love to see what it looked like in color. Congrats Richard on top 10. I should have know this was you......technical perfection! Would love to see this in color - although I'm sure you had a good reason to go with B/W. Brrr... must've been brutally cold - hope it's worth your effort and ends up in the top5. This conveys a sense of majesty, grandeur, and quietness. Very nicely done. This is wonderful. Trails are a really nice, sharp, short length. Rest of the scene is perfect. Great exposure, great tones. Excellent photo. Very nice B&W conversion applied to this photo. I like the clarity in the details of this obviously long exposure. Proudly hosted by Sargasso Networks. Current Server Time: 04/18/2019 07:03:40 PM EDT.